Pamir Law Group works closely with the People’s Republic of China companies to plan, design and implement safe and successful outbound investments. We support senior management in every stage of the process, from international expansion strategy development, implementation planning and execution, to Mergers and acquisitions, partner matching for new market entry, sales/distribution, supply chain/sourcing, branding and technology transfer, negotiation as well as providing ongoing overseas operational support. We have supported our clients in many industries to succeed in bridging to Asia, Europe, North America, Latin America and Africa. Based on decades of advising international companies in their expansion efforts, we have developed a vast network of professionals and experts globally. This enables us to provide holistic end-to-end capabilities and support to Chinese companies, combining a single Chinese speaking point of contact with input from a tailored mix of trusted foreign experts and service providers to ensure we provide solutions adapted to the unique needs of Chinese investors, while benefiting from on-the-ground local expertise and experience. Outbound investment can be a daunting challenge, even for experienced business executives with a track record of success in their home country. Why do we want to invest overseas? What are the strategic drivers to internationalize? What do we need to achieve? Are we ready to take the action for outbound investment? 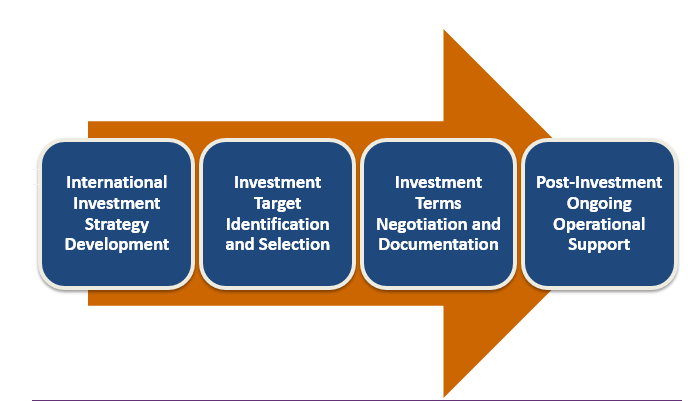 Do we have all the skill-sets internally to insure success in the overseas investment? Do we have the right business culture, language, overseas market familiarity, ability to coordinate multiple professionals and experts, ability to obtain overseas government regulatory approvals, cross-border project management experience, financing planning skills, tax efficient structuring knowledge to save money if we are a sales/distribution, branding or manufacturing or service operation? What improvements are needed to prepare our organization internally to be an attractive partner to potential cooperators/targets? What type of investments are we looking to make, over what time frame? What are our long-term, medium-term and near-term goals? Do we have a comprehensive plan with reasonable stages and contingency plans? Where do we want to invest? What are the factors to decide? 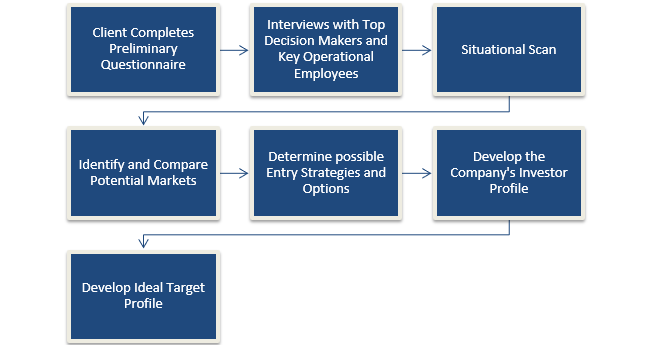 What are the options for an entry strategy? For an expansion strategy? How are we going to find and evaluate outbound investment and partnering opportunities? How are we going to ensure that we are able to manage and successfully integrate the capabilities of the new investment into our larger organization? What are the possible exit strategies over time? How can we save money legally with favorable tax treaties and how do we finance our operations and plans by securing loans and incentives rather than sacrificing equity share and dividends? The strategic development process starts with a questionnaire that provides preliminary answers to basic questions and other strategic considerations. The questionnaire is then followed by a series of interviews with the company’s top decision makers and key operational employees in charge of the overseas effort. This insures that the goals of the organization are clearly articulated and well thought through and that we are well coordinated with the company’s goals and operating team. This insures efficient teamwork. Determine which Targets to approach concurrently, sequentially, consecutively, or as an auction. Produce Additional Information Package for Shortlisted Candidates. Sometimes targets require that the potential buyer states its interest in writing and executes a NDA before providing additional information including financial statements, details about current and planned products and markets, R&D in progress, etc. For more detailed information, please download the full PDF overview of our Outbound Investment Services below.